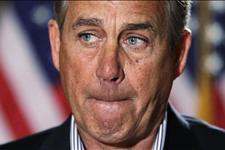 Republican Speaker of the House John Boehner has become a primary advocate of the Obama agenda. If Conservative America has any real intention of ever making an effective stand against the onslaught of liberalism, now is the time to take note of the Republicans who remain firmly committed to principle, as opposed to those who will completely sell out the moment they believe the political winds to be shifting. And of the latter group, no belated apologies or election season reawakenings to conservative ideology should ever be accepted. Betrayal at this critical time must be recognized in its true light, and never again excused or overlooked. On each occasion that the nation appears to lurch left, opportunists within the GOP are quick to exhibit their true feelings of disdain for conservatism, seeking to ingratiate themselves to the prevailing powers while betraying the voters on the right who put them into office. The political and societal upheaval of the past few weeks bears grim proof of the ongoing prevalence of this phenomenon. Of course these same politicians are loud and insistent that they are the valiant gatekeepers of conservatism during those periods when grassrootsAmericaenjoys a resurgence of energy at the ballot box. In 2010, when stunning Republican gains in the House of Representatives put that body under the leadership of the GOP, everyone was a conservative, and all who jockeyed for dominance within the movement made claims of being the new incarnation of Ronald Reagan. It was not long however before newly chosen Republican House Speaker John Boehner began to waffle and capitulate. By the time the 2011 Debt Ceiling debate reached its crescendo, Boehner was in full retreat, essentially giving Barack Obama everything he wanted. Boehner concocted a skirt to hide behind, lamenting that his realm was “only one half of one third of the government” as a means of justifying complete capitulation to Obama’s demand for trillions more in spending. In the process he abdicated the constitutional directive which placed him in complete control of the federal budget. Worse still, many congressional and Senate Republicans defied their 2010 electoral mandate and acquiesced to the debt ceiling hike, likewise seeking refuge in Boehner’s gutless assertion. Now, in the wake of Barack Obama’s reelection, Speaker Boehner is once again looking to sufficiently grovel and capitulate, in vain hopes of avoiding blame for the ongoing disasters of the Obama agenda. Unfortunately, by trying so determinedly to find politically “safe” ground instead of holding fast to conservative principle, Boehner is indeed making himself complicit in the fiasco, along with the members of his party who abandon their principles and accommodate the bankrupting policies of Democrats. Regardless of how venomously Democrats demand their pound of flesh from “the rich” as the contrived cornerstone of debt reduction, enormously increased taxation would merely represent a token effort at deficit reduction. The only road to fiscal recovery is to drastically cut spending. And Democrats regularly make it clear that they have no interest in this approach, since they have no intention of actually addressing or averting the debt crisis. Unfortunately, Boehner has so far agreed to “close tax loopholes” (read: eliminate deductions), raise rates, and defer spending cuts until some unknown future date, which means never. In short, Republican Speaker of the House John Boehner has become a primary advocate of the Obama agenda. Once again Boehner makes the claim that he has no alternative which, properly translated means that he cannot find a political option that does not involve facing the media onslaught, and weathering venomous attacks from his Democrat opponents. Perhaps he should have considered these factors before accepting the post of Speaker. Sadly, Boehner’s total philosophical and moral retreat has greatly emboldened liberal Democrats, who are increasingly aware that while conservativeAmericaremains firmly opposed to them, the Republican Party is completely imploding politically. Even before theNewtowndisaster, the Republican budget surrender appeared as a signal for liberals to press forward with other essential components of their statist agenda. Now, as the nation reels in the aftermath of that unfathomable tragedy, the left gleefully perceives it to be a window of opportunity and believes it may possess sufficient momentum to take out one of the biggest obstacles to its agenda, the Second Amendment. And once again, rather than delivering the political body block that such a seditious effort deserves, too many Republicans are attempting to “find common ground” (another euphemism for caving) with liberal demands that citizens be stripped of their time honored right to bear arms. The evidence is overwhelming that disarming law-abiding Americans is the surest road to increased murder and mayhem. Only last week in anOregonshopping mall, and at aCasperWyominghair salon, potential mass killings were decisively thwarted the moment perpetrators realized that they would face opposition from legally armed citizens. Of course the news media has completely suppressed coverage of these events, since their lessons thoroughly undermine the gun-grabbing goals of the left. Perhaps a few irredeemably uninformed liberal politicians actually believe that they could make society safer by taking guns from the people. If so, those individuals should be removed from office on the basis of their sheer incompetence. However, a far more sinister political cabal invokes these empty claims and exploits tragedies such asNewtown, in service to the ominous cause of amassing uncontested governmental power. In a manner wholly reflective of the bogus “fiscal cliff” debate and the liberal non-answers to it, gun control advocates demand that the American people be rendered totally defenseless and vulnerable. They blindly maintain that debasing the people to such a condition would somehow improve the safety of school children whenever the next mindless monster decides to make them his quarry. Far from being held accountable for the fiscal and societal damage that their policies have spawned, liberals continue to claim the moral “high ground” from which to enforce further conformity to their twisted ideology. Republicans who are unwilling to oppose their abhorrently flawed policies are ultimately guilty of enabling them. Both groups must be identified and their true motivations characterized, so that they can be removed from the political system if it is ever again to function to the betterment of the American people.